To tackle dangerous climate change at the pace and scale the science demands, we must take advantage of every cost-effective opportunity to cut pollution now. Several recent analyses from leading experts on the impacts of carbon pricing demonstrate once again why flexible, market-based policy is the most effective and efficient tool we have to address dangerous climate change. These studies reaffirm that penalizing pollution and requiring companies to pay for their contribution to climate change can help the United States achieve needed reductions while generating substantial revenue. What’s more, none of these studies even account for the enormous benefits of averting climate change impacts. While these studies examine carbon taxes (which place a price on pollution and allow the economy to respond), approaches that establish overall declining pollution limits and allow the market to determine the price can achieve similar pollution reductions and economic outcomes. But since uncertainty about market factors and technological trends prevent even the most robust economic modeling from providing guarantees, it is crucial that any carbon tax policy be linked to clear, concrete pollution reduction goals and include transparent provisions to help ensure those goals are met. A policy where the price is derived from overall enforceable pollution limits already includes those assurances. The analyses by the Stanford Energy Modeling Forum (EMF 32, comprising 11 leading modeling teams), Columbia University’s Center on Global Energy Policy (CGEP) and the U.S. Energy Information Administration (EIA) examine a range of scenarios with price paths from $15 to $50 per ton and annual price escalators from 1 to 5 percent, along with various ways of distributing the revenue. In addition, Resources for the Future and Columbia modeled the carbon tax bill recently introduced in the House by Representative Curbelo and co-sponsors, which includes a starting price of $24 per ton and rising 2 percent annually. In all scenarios that examine a price across the economy, pollution reductions are achieved consistent with meeting or exceeding the U.S. Paris Agreement climate commitment by 2025 of 26 to 28 percent reductions below 2005 levels. On our current path, we will almost certainly fall short of meeting those goals, according to recent analysis from the Rhodium Group. 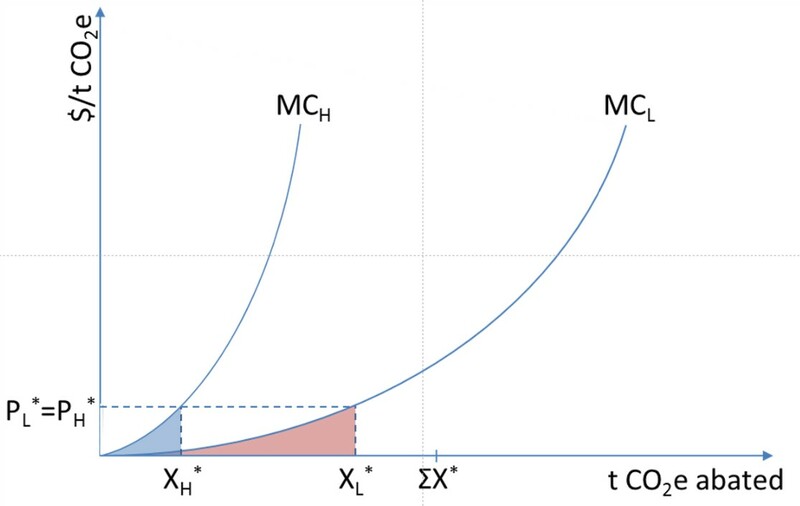 However, the analyses also show that to achieve deeper reductions aligned with long-term, science-based targets (for example, net-zero emissions by mid-century), we will likely need pricing paths at the more ambitious end of the spectrum—as well as companion policies to help the most difficult sectors decarbonize. Of course, a key advantage of pricing pollution is that it will spur innovation—encouraging new technologies and approaches to slashing emissions that today’s models cannot foresee. These advances could allow us to meet our goals at lower costs than anticipated—exactly what’s happened with the well-designed, market-based U.S. acid rain program. The EMF 32 results also underscore that the starting price matters for reductions in the short term, while the rate of increase over time is important for bending the emissions curve down in the long term. For example, in the first decade, the $50 plus 1 percent price achieves roughly 40 percent more cumulative emissions reductions than the $25 plus 5 percent scenario. However, by 2038 cumulative reductions in the $25 plus 5 percent price exceeds the $50 plus 1 percent price, and cumulative emissions through 2050 are similar. This dynamic is important since cutting pollution now is good for the climate, but we also need to sustain the pollution decline over the long term. Ultimately, the total cumulative climate pollution in the atmosphere is what matters. Both EMF 32 and CGEP’s results suggest that GDP would continue to grow at historical or near-historical rates across scenarios—and could be net positive, depending on how revenue is used. Additionally, despite misleading rhetoric from opponents of climate action, a carbon price would have an extremely small net effect on employment. A recent analysis from Resources for the Future suggests that the net impact of a $40 tax would be less than half of one percent or even lower. And while many other studies confirm that net impacts on employment are likely to be small, they note that even mainstream modeling efforts tend to overestimate the impacts by a factor of 2.5 or more. Meanwhile, national climate policy would mean investing in the clean energy revolution: the economic engine of the future. None of these analyses even consider the economic benefits associated with slashing climate pollution. Citibank estimates that climate change will cause tens of trillions of dollars in damages if left unchecked. These analyses also do not account for the additional associated benefits such as improvements in air quality. Taken together, these benefits make an overwhelming economic case for reducing pollution as soon as possible. All analyses of an economy-wide price find that the vast majority of reductions occur in the power sector, driven primarily by declines in coal consumption. In the analyses examining $50 per ton scenarios, Columbia shows that approximately 80 percent of economy-wide emissions reductions occur in the power sector with a significant shift towards renewable energy, and EMF 32 results predict that coal demand reaches near-zero by 2030. This is consistent with modeling analysis conducted by the United States Mid-Century Strategy for Deep Decarbonization in 2016. Some other sectors, notably transportation, tend to be less responsive to carbon pricing in the models—at least in the short term. Both Columbia and EMF 32 find that transportation sector emissions only drop a few percentage points relative to 2005 levels by 2030 even in the higher pricing scenarios. These results underscore the importance of policies that put a firm limit on pollution across the economy as well as companion policies that can help address specific barriers to change in sectors that will be more difficult to decarbonize. Carbon pricing has the potential to raise significant revenue—for example, just under a trillion dollars over the first 5 years with a $40 price, rising at 5 percent. How revenue is used plays a significant role in overall economic impacts as well as the distribution of those impacts across regions and populations. For example, CGEP’s analysis finds that certain revenue recycling approaches—including the use of revenues to reduce payroll taxes or the national debt—result in larger long-run economic growth than scenarios without a carbon price. EMF results find that using revenues to reduce capital income taxes generally achieve the highest GDP growth of the scenarios they considered, but these gains are disproportionately captured by the wealthy. Alternatively, revenue can be directed to not only avoid this sort of inequitable distribution of benefits, but also protect low-income families and disadvantaged communities who already bear a disproportionate share of the burden of climate change and air pollution, and are more sensitive to changes in energy costs. For example, Columbia’s analysis shows that approaches putting even a small portion of revenue back into the pockets of American households can compensate those in the lowest income quintile from potential increases in energy costs. The Center on Budget and Policy Priorities has also demonstrated how carbon pricing can be designed to fully offset impacts of the policy on the most vulnerable households and provide considerable support for others while leaving significant revenue to spare. While assumptions and model structures may differ, bottom line findings all point in the same direction: well-designed, national carbon pricing policy can spark deep reductions in climate pollution alongside economic growth, while spurring technological innovation and protecting vulnerable populations. The “price” itself is only one part of effective climate policy. We need firm declining limits on pollution to accompany a price and ensure environmental outcomes, as well as a portfolio of approaches working together to ensure that investment and innovation are happening where it matters. A pricing program can be a catalyst for driving additional climate solutions at the federal, state, and local level, while other policies can share the burden and tackle the problem from multiple angles. This model has already proven itself in California, where the state has hit pollution reduction targets even earlier and at lower cost than anticipated. To be successful, we need bipartisan leadership and a serious discussion about meaningful solutions. The United States can and must address the challenge by working together in the best interest of all Americans to put in place ambitious, effective, and fair climate policy. Still, China is cleaning up its air faster than the United Kingdom did after its Industrial Revolution. Despite this early success, however, China could spark even more efficient improvements by adopting market-based incentives. Let’s take a look at how both countries fared immediately after each of their industrial booms. Figure notes: The figure shows annual average concentrations of total suspended particles (TSP), a coarse and now outdated measure of air pollution. 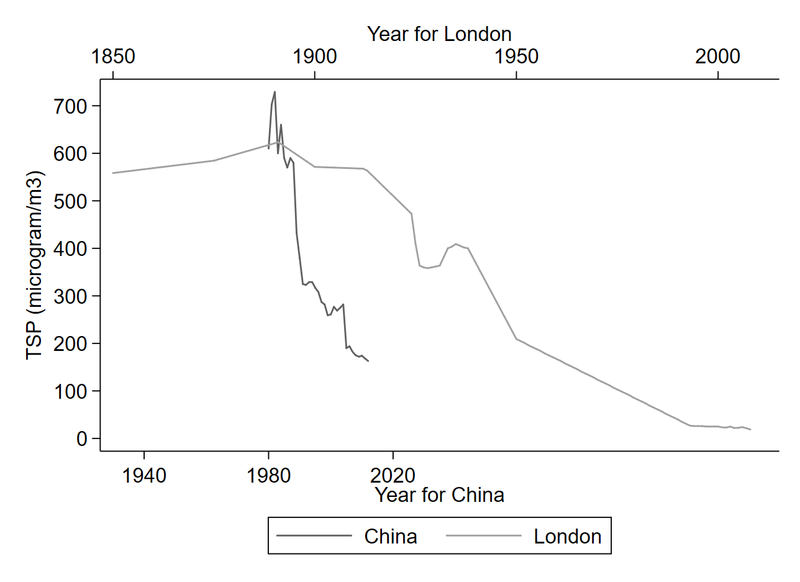 The black line shows the average for China, while the grey line shows London. Data sources: TSP concentrations for China through 2003 are based on the China Energy Databook 9.0 based on data provided by State Environmental Protection Administration. From 2004 on, TSP concentrations for China are based on author-collected air pollution index (API) data from the MEP datacenter. I imputed PM10 concentrations based on information on the main pollutant on a given day and the assumption that an API reading below 51 reflects PM10 (see Stoerk 2016 for explanations on the procedure). I then converted the PM10 concentrations into TSP using a conversion factor of 2 following Matus et al. 2012. TSP concentrations for London come from Fouquet 2011, who generously shared his dataset. Air quality in London is far from perfect, but it’s also come a long way from the days when people died in the “Great Smog.” The graphic above brings together the earliest known air pollution data from China, from 1980 to 2012, and from the UK from the Industrial Revolution until 2008. Air pollution levels in the main Chinese cities at the beginning of the 1980s were almost exactly at the level of London at the height of the Industrial Revolution in 1890 (a shocking outlier is Hohhot, the capital of Inner Mongolia, which reached a concentration of Total Suspended Particles of 1,501 µg/m3 in 1987, possibly the highest level of urban air pollution in recorded history). 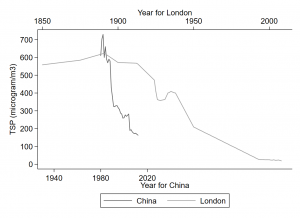 The difference is in the speed of improvements: Air pollution in China has been decreasing at a similar trajectory as London’s 90 years earlier, but at twice the pace. While extreme air pollution levels in China’s recent history are typical for an industrializing economy, its pace in cleaning up the pollution is fast by historical standards. China started to seriously control air pollution from 2006 to 2010 by limiting emissions for each province. Relying on satellite data, my research shows that this first attempt was ultimately successful in reducing nationwide SO2 emissions by over 10 percent relative to 2005. Studying compliance over time, however, suggests that reductions in air pollution only happened after the Chinese government created the MEP in 2008. After its creation, among the many changes in environmental policy, the MEP started to gather reliable SO2 emissions data from continuous emissions monitoring systems (CEMS) at the prefecture level and increased the number of enforcement officials by 17 percent (a task that EDF China actively supported). This early success notwithstanding, China could do better by implementing well-designed market-based solutions, policies that align with the country’s ambition to combine economic prosperity and environmental protection. Or, in the words of President Xi, to combine ‘green mountains and gold mountains’. For example, a well-designed cap-and-trade program at the province level could have decreased the cost of air pollution abatement from 2006 to 2010 by 25% according to my research. The anticipated launch of a sectoral emissions trading system to limit a portion of China’s greenhouse gas emissions suggests that the Chinese government is looking to embrace lessons learned in air pollution control and wishes to build on its own pilot market-based pollution control programs to bring its environmental policy into the 21st century. EDF is playing a key role in helping this endeavor through both hands-on policy work and research. The timing is serendipitous: China is at a cross-roads in environmental policy. Evidence based policy making is welcome. And data quality has improved in recent years. Given the right set of policies, countries can control air pollution, and improvements in air quality typically go hand in hand with economic prosperity. Both China and London have remaining challenges. Despite dramatic improvements, Londoners, like the Chinese, still live with significant air pollution. A recent report on London’s air pollution found the city is not close to meeting WHO standards. Meeting them will be a challenge, in part because of the complexity of the causes (road transport accounts for over half of local contributions). So just as London must keep battling to improve air quality, Beijing will need to do likewise–but at least now each can now learn from the other. This blog was co-authored with Jonathan Camuzeaux, Adrian Muller, Marius Schneider and Gernot Wagner. After a nearly 20-year upward trend, U.S. CO2 emissions from energy took a sharp and unexpected turn downwards in 2007. By 2013, the country’s annual CO2 emissions had decreased by 11% – a decline not witnessed since the 1979 oil crisis. Experts have generally attributed this decrease to the economic recession, and to a huge surge in cheap natural gas displacing coal in the U.S. energy mix. But those same experts mostly overlooked another key factor: the parallel rise in renewable energy production from sources like wind and solar, which expanded substantially over the same 2007-2013 timeframe. Between 2007 and 2013, wind generated electricity grew almost five-fold to 168 TWh and utility-scale solar from 0.6 TWh to 8.7 TWh. During the same period, bioenergy production grew 39 percent to 4,800 trillion BTUs. Given these increases, how much did renewables contribute to the emissions reductions in the United States? In a paper published this month in the journal Energy Policy, we use a method called decomposition analysis to answer just that. Decomposition analysis is an established method which enables us to separate different factors of influence on total CO2-emissions and identify the contribution of each to the observed decrease. The factors considered here are total energy demand, the share of gas in the fossil fuel mix (capturing the switch from coal and petroleum to gas), and the share of renewables and nuclear energy in total energy production. Introducing a new approach for separately quantifying the contributions from renewables, we find that renewables played a crucial role in driving U.S. energy CO­2 emissions down between 2007 and 2013 – something which has previously largely gone unrecognized. According to our index decomposition analysis, of the total 640 million metric ton (Mt) decrease (11%) during that period two-thirds resulted from changes in the composition of the U.S. energy mix (with the remaining third due to a reduction in primary energy demand). 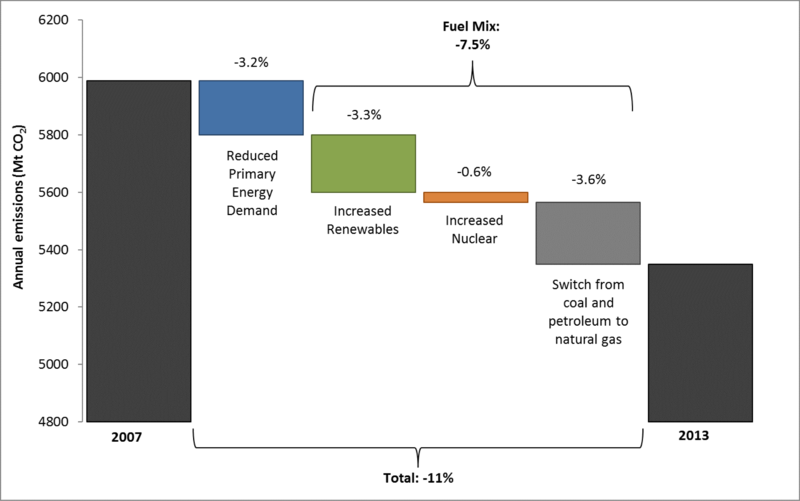 Of that, renewables contributed roughly 200 Mt reductions, about a third of the total drop in energy CO2 emissions. That’s about the same as the contribution of the coal and petroleum-to-gas switch (215 Mt). Conversely, increases in nuclear generation contributed a relatively minor 35 Mt. 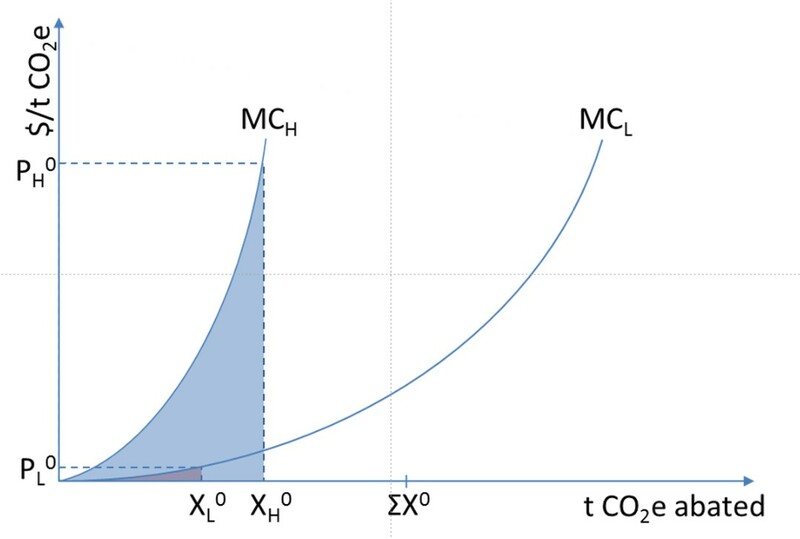 While the significant role of renewables in reducing CO2 emissions does not diminish the contribution of the switch to natural gas, it is important to note that the climate benefits of switching from coal and petroleum to gas are undermined by the presence of methane leakage along the natural gas supply chain, the extent of which is likely underestimated in national greenhouse gas (GHG) emissions inventories. Methane, of course, is a powerful greenhouse gas. Methane leakage from increased natural gas use could have wiped out up to 30% of the short-term GHG benefit (on a CO2-equivalent basis) calculated in this paper of switching from coal and petroleum to natural gas. For the natural gas industry to truly sustain the claim that it has made a positive contribution to reducing the country’s carbon footprint, the methane emissions associated with natural gas must be substantially reduced. These results show that past incentives to support the expansion of renewable energy have been successful in reducing the country’s emissions, and that decreasing costs for renewable energy offers some hope for continued progress even despite the current administration’s refusal to address climate change. Such progress, however, will never be sufficient without ambitious climate and clean energy policies- whether at the federal or at the state level – that can drive further emission reductions. And then there were three. As of January 1st, 2018, Ontario has joined California and Québec, linking their respective carbon markets. In a post-Paris world of bottom-up climate policy, linking of climate policy matters. It provides a concrete step forward on the Paris Declaration on Carbon Pricing in the Americas. It shows that, while the U.S. federal government is dismantling much-needed climate protections, states, together with Canadian provinces, are moving forward. Linking, if done right, can be a powerful enabler of greater ambition. It also raises important questions. To be clear, there are real advantages to linking carbon markets: Linking of climate policies is a political affirmation of joint goals and a signal to others to move toward concerted carbon policies. It also shows the real advantages of market-based environmental policies. Bigger markets also afford greater cost-savings opportunities. Now consider the idealized linked market. Total abatement (ΣX) will remain the same. The difference? 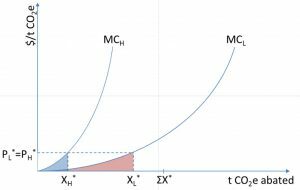 Prices equilibrate across markets, with PL now equal to PH, lowering the total cost of achieving the same tons of carbon dioxide-equivalent (CO2e) abated. Abatement costs clearly matter. The lower the costs of achieving the same goal, the better. All else equal, the two jurisdictions can now afford to abate more at the same cost. Will all else indeed be equal? It is clear the world needs to do a lot more to stabilize greenhouse-gas concentrations. That means quickly getting net emissions of carbon dioxide going into the atmosphere to zero. There, too, the simple textbook case can be instructive. Linking implies sending money from country H to country L to pay for the cheaper abatement. This raises important questions of baselines, accounting, and transparency. Moreover, lower abatement costs are not the only objective of climate policies. Direct support for the deployment of new, cleaner technologies often tops the list. 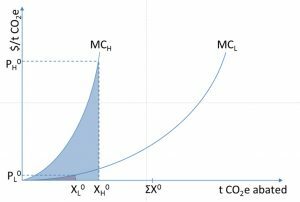 Given the political economy of reducing greenhouse-gas emissions in the first place, there are many competing domestic objectives and indeed real tradeoffs that need attention. The big question then is what linkage does to the overall level of policy ambition. Lower costs imply the potential for more ambitious policies. That is clearly good but the devil is in the details. It is important to assure that coordination and collaboration among different jurisdictions really do raise the level of ambition, as the Paris Declaration pledges. It is also clear that climate policy overall ought to have a balance of bottom-up and top-down policies. Linkage is one potentially important element in that equation. The ultimate measure, however, is tons of greenhouse gases abated from the atmosphere. In the face of havoc wrought by recent storms and hurricanes, Moody’s Investors Services, Inc. has declared that state and local bondholders must account for climate change or face downgrades. It is the first of the three major credit rating agencies to incorporate climate change risks into its ratings assessment, a move that may incentivize policymakers to make smarter, long-term investments in resilience efforts like stormwater systems or flood management programs. Bond rating agencies like Moody’s help investors determine the risk of companies and governments defaulting on repayments. Revenue, debt levels, and financial management are all common measures of creditworthiness. States at high risk–mainly on the coast–including Texas, Florida, Georgia and Mississippi, will have to account for how they are preparing for the adverse effects of climate change, including the effects of storms and floods, which are predicted to become more frequent and intense as temperatures climb. In its report to its clients, Moody’s outlined parameters that it will use to assess the “exposure and overall susceptibility of U.S. states to the physical effects of climate change.” Some of these parameters include reviewing an area’s economic, institutional, fiscal strengths, and susceptibility to event risk – all of which will influence the borrower’s ability to repay debt. Coastal risks, like rising sea levels and flooding, and an increase in the frequency of extreme weather events, like tornadoes, wildfires, and storms, are just a few of the indicators that will be incorporated into the rating. This wasn’t always the case. Take New Jersey’s Ocean County, for example. In 2012, Hurricane Sandy devastated Seaside Heights, destroying local businesses and oceanfront properties. Yet, last summer, Ocean County sold $31 million in bonds maturing over 20 years – bonds which received a perfect triple-A rating from both Moody’s and S&P Global Ratings. In 2016, major bond companies issued triple-A ratings for long-term bonds to Hilton Head and Virginia Beach, despite the U.S. Navy’s warnings that the latter faced severe threats from climate change. A recent World Bank study calculated future urban losses that many coastal cities may face because of climate change; Miami, New York, New Orleans, and Boston ranked highest in overall risk. In March 2016, Moody’s and S&P gave top ratings to bonds issued by Boston of $150 million maturing over 20 years, evidently not accounting for any associated climate risks. In Moody’s new effort to incorporate the risk of climate change into its ratings, it is trying to account for “immediate and observable impacts on an issuer’s infrastructure, economy and revenue base, and environment” as well as economic challenges that may result, such as “smaller crop yields, infrastructure damage, higher energy demands, and escalated recovery costs”. The hope: in facing the threat of a rating downgrade and more expensive debt, local governments should move to implement major adaptation and resilience projects as a way to entice investors, and of course, to plan for the effects of climate change.